With managed IT services, you delegate many or all of the services and maintenance related to your enterprise IT to a third-party IT company. That company provides complete IT services and troubleshooting, typically on a remote basis. Responsibility for IT software applications, service provision, and maintenance falls to your vendor, who can provide IT assets from anywhere. What types of U.S.-based businesses can benefit from managed IT? Businesses anywhere in the United States can seize competitive advantages and reduce IT costs using managed IT services. That includes many small and medium-sized businesses (SMBs) as well as multinationals with U.S. operations. With the time and money you save through a managed IT agreement, you can stay focused on your business does best. Managed IT services will provide you with extra peace of mind knowing that your IT is always “world class” and the technicians in charge of them are fully trained. Plus, you will get a higher quality of service that will empower your business to achieve more. This results in better software, better security, and higher productivity with a seamless IT experience. What services do I get when I choose managed IT? No matter where you are nationwide, there are certain services you are guaranteed to get with virtually any type of managed IT agreement. They include 24-hour security monitoring and software updates, like patch management to ensure your key applications are always up to date. Managed IT services will often eliminate the need for data centers in your own enterprise and cut out the complexity of monitoring many software licenses for your growing workforce. Hardware, software, and all necessary apps can be set up exactly according to your evolving business needs. What if something goes wrong? Problems can be resolved faster than ever with virtual IT techs who can intervene to fix the problem 24 hours a day. Pre-installed software updates, convenient email troubleshooting, data breach response, and more are available. Plus, all services are guaranteed to be available when you need them based on an ironclad Service Level Agreement. 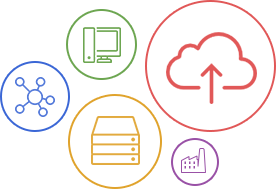 At ETech 7, we strive for the industry gold standard of 99.999% uptime, and should you need it, ETech 7 can help you develop your entire IT strategy from the ground up. We are always keeping an eye on the latest IT technology trends and can help you with your IT stretch goals, such as enterprise security certification and technology alignment. What kind of managed IT plan is best for my enterprise? No matter where you are in the U.S., it is vital to have fast and reliable IT services that both your employees and your customers can rely on. There are many different options to choose from, so your selection process should begin with a complete evaluation of your needs with a prospective managed IT partner. That will help your ensure you get a powerful, yet cost-effective plan. Managed IT plans should be tailored to the needs of each enterprise, which vary by industry and size category. Still, there are some elements most companies benefit from regardless of their other characteristics: Enterprise application management, IT virtualization and remote access services, complete IT security, IT troubleshooting (help desk), and data backup. How can managed IT keep me up to date on the most important technology trends? With managed IT, your in-house technology personnel can focus their attention on high-level, value-added tasks instead of spending hour after hour ensuring your existing services work the way they’re supposed to. That raises the ROI of your technology organization and can even improve morale, leading to better productivity per head and all the advantages that suggests. How does managed IT improve the day-to-day operations of my business? Managed IT can have a positive effect on all the functions of your business. Outsourcing your strategic technology services to a qualified IT vendor is a commitment to ensuring everyone in your organization has the tools they need to outperform expectations. As you communicate your changing business requirements, there will always be someone moving the ball forward. Plus, it saves time and money compared to the time-consuming process of planning, deploying, and maintaining the productivity software and network services you need. With a managed IT vendor, you only need to know what results you need, not what tools will get you there. Your vendor, in turn, ensures that you have the selection of services most appropriate for you. What kind of pricing can I expect from a managed IT services firm for my area? No matter where you are in the United States, you don’t need to worry about your region or area adding lots of cost to your managed IT estimate. Managed IT packages are provided by a third-party brand that can operate efficiently from anywhere in the country. This makes it a truly ideal solution for companies that are growing quickly, even in high-cost U.S. markets. Since geography is not a factor with managed IT, your plan is based entirely on the type of services you need on a monthly basis. Naturally, if you expand the total number of end user “seats” or major business locations, the cost of your package may rise. Likewise, premium services add incremental costs – though much less than they would when deployed in-house. Most established businesses leverage managed IT to achieve ROI far greater than what they could produce by starting an IT organization from scratch. What’s more, they can stay fully aligned as their business unfolds, instead of having to painstakingly hire and develop teams. ETech 7 makes it easy for you to get a custom quote to meet your needs. No matter where you are in the United States, we can help. Our experts are always available to analyze your current IT and design a customized plan – and any selections you make can grow with you in the future. How does managed IT help my business grow? Outsourcing IT services can give an already growth-focused business the extra momentum to capture great opportunities throughout the United States. Fortune 500 enterprises and small startups alike have reaped the benefits by cutting down the expenses associated with the latest technology, reducing the need for expensive hiring, and keeping the organization lean. When you leave management of your day-to-day IT functions to a professional outsourced team, staying ahead of the curve on technology adds no drag to your business. You’ll never have to be concerned about being unable to meet the productivity needs of a mobile workforce. Plus, you are covered with additional IT security resources, though security best practices remain vital. When managed IT is done right, business owners get to focus on the top priority – growth – without stopping to deal with computer glitches or other hiccups. Can managed IT services meet my regulatory compliance needs? Regulation-driven industries like healthcare and finance have special IT needs. Confidential data needs to be stored safely and must use the appropriate level of encryption.Making a decision is difficult. However, keep in mind that a prospective managed services provider should be able to demonstrate a complete understanding of your needs. That can come through industry associations, case studies from similar enterprises, and so on.All regulatory requirements should be noted in a written Service Level Agreement so you can track adherence and take immediate action if concerns arise in the future. How can managed IT keep my data safe? Data safety is imperative for any business that wants to attract discerning customers and clients. Many regulation-forward enterprises, such as finance and healthcare, have to deal with strict data management regulations that can entail huge fines if compliance breaks down. Even industries excluded from these demands need to make data security a leading strategic priority. With managed IT, you protect your core operational data and the sensitive information your customers provide. A managed IT vendor is constantly monitoring the entire provisioning structure that allows applications and other data to flow into your network. IT security can be hardened by choosing 24-hour remote monitoring services that extend to your own network. Managed IT is perhaps the best solution available in today’s rapidly evolving IT security landscape. Viruses can be detected and stopped even when powered by the most complex automated systems. This is because a managed IT services provider can offer you economies of scale, bringing enormous resources to bear on each and every security incident. Does remote access add any risk to my data compared to in-house IT access? Although many people feel unsure about giving third-party IT techs remote access at first, the truth is not what they would expect: Remote access is arguably more secure than having someone on-site who interacts with your network architecture directly, since high-level encryption can be used across the process. This significantly limits the scope for human error. I am a small business. Would I benefit from managed IT? No matter the size of your business, you can get outstanding benefits from managed IT. The right managed IT package is completely customized to your needs, so it is affordable and scalable even if you have less than ten employees today. Plus, it will always grow with you. As trends and expectations change, your business can remain at the forefront. If you’re concerned about staying competitive, remember managed IT empowers you with technology comparable to Fortune 500 and the entrenched rivals in your market. On top of that, these extensible services protect you from becoming a target of opportunity for hackers, who often seek out smaller businesses to launch their most determined attacks. I may be opening new offices in the future – will this disrupt my managed IT? No. No matter where your expand your business in the United States, your complete package of managed IT services will always be there at your fingertips. This is true whether you open new offices throughout the country or even move your headquarters to a different location. One of the best benefits of managed IT services is that they can be there for you instantly when your geography changes. You don’t have to fret over whether a new office is “wired right” due to the 24-hour on-demand nature of remote and virtualized services. Rules for security and data encryption differ in jurisdictions throughout the world, so adopting managed IT services before you expand internationally is a smart move. No matter where you go, your services can be optimized to provide the quality you expect. Will managed IT services benefit my company long term? Yes! Enterprises across the U.S. have discovered that managed IT makes their business more efficient. The sooner you get started with a managed IT solution, the sooner you’ll see savings and performance advantages start to accrue. These benefits compound over time, making a bigger and bigger difference in how you can allocate your resources. All of the most competitive and lucrative markets in the United States are moving toward greater process automation. Managed IT will help you harness this trend while giving you the chance to be even more strategic in your long-term hiring and capital investments. With lower costs, higher IT ROI, and better use of your time, the sky's the limit! Can managed IT make my data accessible while I travel for business? Uninterrupted access to your data is one of the most attractive aspects of any managed IT plan. When you or other key stakeholders travel, you won’t need to think twice about whether you can get the various applications or data you require – you can transition seamlessly to using your favorite mobile devices or desktop hardware anywhere in the world without missing a beat. The key to this secure, unfettered access is the Virtual Private Network (VPN). A VPN produces a completely secure and private route between your personal device and your managed IT vendor or your corporate intranet, as the situation may require. The route can be created any time, but it is only active while in use, so it remains invisible to hackers. Data accessibility through VPN is so easy and convenient, many enterprises have used it as the basis of their distributed virtual teams. Since you can work from anywhere, you can easily leverage the talent pool you need throughout the United States or around the world. Get started with managed IT by contacting the team at ETech 7. We look forward to helping you achieve your goals. "We've hired ETech 7 to setup our backup solution and found them to be a great asset. They hit the ground running quickly, work well with the team and gets results."